University of Southampton Research Fellow, Andrew Woolley, has discovered a manuscript of a lost Vivaldi flute concerto among papers housed in the National Archives of Scotland in Edinburgh. The set of parts for Il Gran Mogol has since been authenticated as the work of the 18th century composer and has not been performed in modern times. It will receive its modern day premiere in Perth, Scotland in January. “This piece was previously known only from a mention in the sale catalogue of an 18th-century Dutch bookseller. Discovering that it is actually in existence is unexpected and hugely exciting,” says Andrew Woolley. It is unclear how exactly the concerto was brought to Scotland, but it is believed the manuscript was the property of the flute-playing nobleman Lord Robert Kerr, son of the 3rd Marquess of Lothian, and that he may have acquired it on a Grand Tour of Europe in the early 1700s. The manuscript is not in Vivaldi’s hand, but it is a copy in the hand of an 18th century professional musician or copyist. It was preserved among the family papers of the Marquesses of Lothian – acquired by the National Archives of Scotland in 1991 – eventually to be discovered by Andrew Woolley. Although the catalogue describes the title and composer, which are recorded on the manuscript, he is the first scholar to identify the significance of the work. Il Gran Mogol belonged to a quartet of ‘national’ concertos – the others, titled La Francia, La Spagna and L’Inghilterro, remain lost. The flute concerto Il Gran Mogol is almost complete, missing just a part for the second violin. 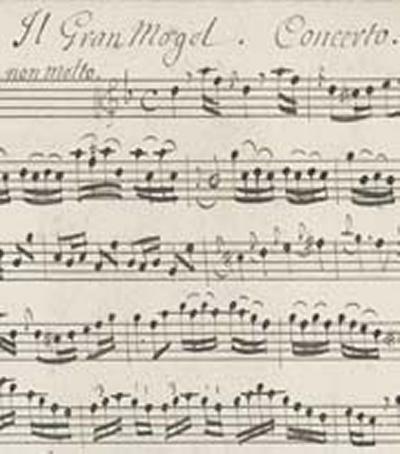 Andrew has been able to reconstruct the missing part by referring to the manuscript of another flute concerto by Vivaldi, kept in Turin, which appears to be a reworking of Il Gran Mogol. Two other musicians connected to the University will help give the concerto its modern day world premiere at Perth Concert Hall, Scotland on 26 January 2011. Adrian Chandler is a Research Fellow at Southampton and renowned violinist, specialising in the works of Vivaldi. He will perform the piece with other members of the leading early music group and Gramophone award winners, La Serenissima, of which he is Artistic Director. University of Southampton lecturer and leading performer on early flutes, Katy Bircher, will play the solo part. La Serenissima will perform and record the work using Andrew Woolley’s new edition, published by Edition HH later in the year.